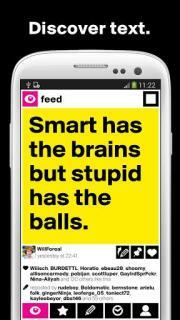 Boldomatic is the anti-social, text-only network. Featured in TechCrunch as the Instagram for Text, and with over 500'000 statements from 170 countries, Boldomatic offers a community for those who enjoy the freedom and exploration of thoughts. Shameless, partially offensive, yet strangely profound. Witty sayings, quotes, poetry, song lyrics or just random thoughts... craft it with Boldomatic and share it with your universe. If you can't take irony or sarcasm, it might not be for you and you're better off staying on Facebook or posting photos of your cat on Instagram. Boldomatic is all about clever text and pure design. Built with Swiss Design &amp; Engineering excellence. Identity: Used only when you choose to connect with Twitter or Facebook for posting to.Contacts/Calendar: Used only when explicitly asking Boldomatic to find friends from contacts or inviting contacts.Location: Used only when asking Boldomatic to add the GPS location to a post or when browsing nearby posts.Photos/Media/Files: Used only when saving a post to your camera roll or uploading a profile photo.